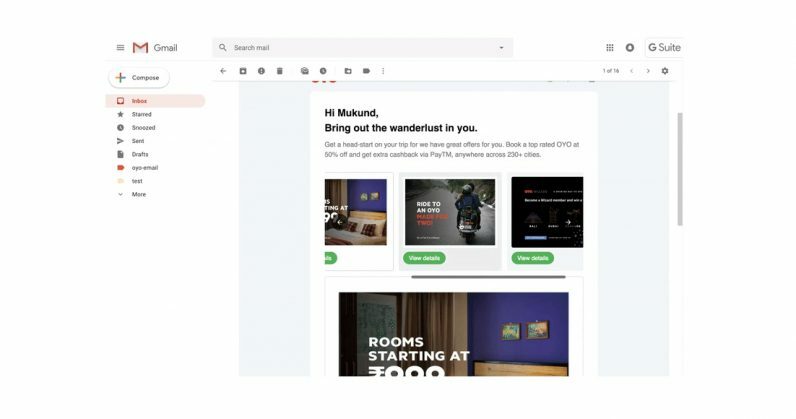 Google is bringing a major upgrade to Gmail that will let you interact with emails in your inbox just like you would with the web pages they often lead you to: look up hotel listings, fill out forms, and browse products you want to buy. That’s thanks to Google’s AMP technology, which also powers many of the fast-loading mobile pages and articles on sites that use the framework. It’s rolling out to Gmail‘s desktop app today, and will eventually become available on mobile as well. A quote on Google’s AMP site for devs describes this as “the biggest thing happening to email since the creation of email.” That’s kinda true – but it mostly really applies to promotional and transactional messages sent to you by companies and service providers. As of now, it doesn’t change anything for how you’d communicate with friends. It’s still a good thing, though, because it could mean less time spent triaging your emails. For example, you could reply to a comment addressed to you in a Google Doc without having to open up the app. I imagine that similarly, in messages from a project management app, you could mark tasks assigned to you as completed, or delegate them to a colleague right from the notification email. For marketers, it means they can personalize their messaging more than ever before, and let you see more content than one could reasonably fit into an email message. If they send you a catalog of products related to your preferences, the message could include a carousel of items that’s up-to-date and includes only those that are in stock, or on sale in real-time. As far as I can tell, it doesn’t yet support payments, but this might become possible at some point in the future. It’ll be interesting to see if this becomes a global standard across email service providers. Google noted that if you’re using Gmail in a third-party client, you’ll only see the static version. It might be a while before people demand this sort of interactive functionality, but it already sounds like the next step in the evolution of email.